Rome’s National Gallery of Modern and Contemporary Art is located near Valle Giulia. It hosts 20,000 works – paintings, drawings, sculptures and installations – and offers a great view on art starting from the 1800’s to today. This is the only national museum entirely dedicated to modern and contemporary art. The National Gallery is supported through the special autonomy granted by the Reform of MiBAC (Ministero dei beni e Attività Culturali – Ministry of Cultural Heritage and Activities); it is a place of research and experimentation where one can think about languages, exhibition experiences and the role of contemporary museums. The decision to have a museum in Rome where to collect all excellences presented in National Exposition was the first sign of political awareness aimed at establishing a common cultural identity, symbol of Italy as a new state. In 1883, Guido Baccelli obtained the King’s signature on a decree that established in Rome a national gallery of modern art. On 5 March 1885, the Gallery — containing three large rooms and three small rooms located on the first floor of the Palazzo delle Esposizioni (Palace of Exhibitions) of via Nazionale — opened to the public. The collection increased thanks to the works of important elements of Roman culture such as Ettore Ferrari and Aristide Sartorio, who contributed to incentivise and bring value to Italy’s art production. In 1911, the architect and engineer Cesare Bazzani (1873–1939) designed Palazzo delle Belle Arti — the Palace of Fine Arts — for the Universal Exposition held in Rome in the same year to celebrate the 50th anniversary of the Unification of Italy. Three years later, the Palace located at number 131 of Viale delle Belle Arti became the see of the National Gallery of Modern and Contemporary Art due to the initiative of Giovanni Rosadi MP aimed at giving a final location to the collection born in 1883. The works of art achieved through the so-called Quadriennali d’Arte — Art events held every four years — and Exhibitions held all around Italy were so many that in 1933 Bazzani had to double the exhibition space of Palazzo delle Belle Arti. In the same period, other two museums were created to collect contemporary art works: the Civic Gallery of Modern and Contemporary Art of Turin — opened in 1895 as an ideal completion of the Civic Museum — and Florence’s Gallery of Modern Art. The reasons that led to the birth of these two museum were mainly the desire and need to represent and exalt the respective regional schools of the late 1800’s. On the contrary, the National Gallery was absolutely innovative as it had a policy regarding all the country. This new aspect was emphasized also in terms of image by the importance of its see, i.e. at first Palazzo delle Esposizioni and then its final location in Valle Giulia where it still stands today. Since its foundation at the end of the 1800’s, the task of the National Gallery has always been to collect and document works of contemporary art. In particular, in the period managed by Bucarelli, the operating model — still valid nowadays — was to purchase works directly from the artist. This gave the purchase further importance as it supported and encouraged young artists as well as increase public property. After the fall of the fascist regime and the reopening of the Gallery to the public, the Curator Palma Bucarelli decided to update the setting in line with the criteria used by modern museums. The new setting established by the curator foresaw a round path going clockwise from left to right. The gardens in front of the building hosted for the first time a permanent exhibition of sculptures. Palma Bucarelli even worked in divulging the international art of the time by hosting exhibitions of artists such as Pablo Picasso, Piet Mondrian and Jackson Pollock. In 1960 — together with the art critic and historian Giulio Carlo Argan and with the help of Walter Gropius — she thought about increasing the body of the building, but the project was never completed due to lack of funds. 13 years later, the task was assigned to the architect Luigi Cosenza, who in line with Bucarelli’s idea implemented the project of a museum with an educational task, a place of cultural aggregation. In line with this view, the new construction foresaw a dedicated space for an auditorium and for the gardens. During the 70’s in Italy, saw the beginning of a new concept for museums: they were no longer just a place where to collect objects; they were even a space in which to make art. Thus, many alternative spaces — somewhat in between information centres and galleries — opened up. Until then, Italian museums had not recognised the historical value of the many new Italian avant-garde movements. After World War II, galleries and non-profit spaces started playing an active role in terms of promotion and information. Rome’s National Gallery acted as a pioneer, hosting exhibitions of artists that were considered scandalous such as Alberto Burri and Piero Manzoni, putting Palma Bucarelli’s position at risk. In 1975, after the Ministry of Cultural Heritage was established, the museum acquired the title of Special Office. Under the direction of Italo Faldi — from 1975 to 1978 — the Gallery strengthened its role of preservation and development through a programme based on Italian art exhibitions of the 1800’s and 1900’s and on European and American art, all within a context of international collaboration. Giorgio de Marchis was the new curator between 1978 and 1982. In a period that saw the beginning of mass exhibitions, de Marchis focused on a museum exhibition seen as a cultural production. The programme of the exhibitions followed clear lines of study of Italian and foreign art of 19th and 20th century, in line with the collections and history of the museum. Indeed, the many exhibitions organised at the time regarded the history of the art of 1900’s — De Chirico, Abstract Art, Leoncillo — the history of the museum and its collections, the current scenario, exploring even the then recent minimal art through the sculptures of the collection of Panza di Biumo (1980). Some important donations started in the 70’s. Due to their size, they were hosted in separate buildings in order to create a series of satellite museums. 1979 saw Manzù di Ardea’s donation that opened to the public in 1981. 1986 saw the donation of the Anglicist Mario Praz — opened in 1995 in Palazzo Primoli in via Zanardelli, Rome. 1995 saw also the opening of the Boncompagni Ludovisi museum of decorative arts, fashion and costume in via Boncompagni — the 1972 donation had been blocked by the family heirs. The entire gallery underwent a great restructuring and a reorganisation of the collections between 1995 and 1999. These works were made under the guidance of the curator Sandra Pinto, using the funds for the 2000 Jubilee year. In 1997 the Gallery received the Schwarz donation of surrealism and Dada, thus was able to fill an important gap. Maria Vittoria Marini Clarelli became the Gallery Curator on 1st July 2004. In 2011, she rearranged and reorganised the works giving them a strong visual and aesthetic impact thanks to the original project made by the architect Federico Lardera. In 2015, following the international selection made by the Ministry of cultural heritage, activities and tourism under initiative of the Minister Dario Franceschini, Cristiana Collu was appointed general director of the National Gallery. The current setting of the collections — intended as an exhibition on time — follows simultaneous paths in which works are placed next to one another according to assonance, contrasts, reference and cross-reference. Even Cesare Bazzani’s building has been involved in this new interpretation establishing a dialogue between present and past, an almost archaeological method that has brought the building back to its original splendour. Designed by the architect Cesare Bazzani as the main pavilion of the 1911 Universal Exposition, Palazzo delle Belle Arti was built to celebrate the grandeur of Italian culture that the government of the time wished to promote. The building has a neoclassical style. The design is that of a Greek temple with a great stairway to access the pronaos, two long sides containing pilasters with four pairs of twin columns decorated in liberty style. There are love festoons, entwined strings, masks and ram heads that give a great elegance to the building. On the upper fascia, the facade is decorated by three alto-relievo friezes: on the left, Il corteo della Bellezza e della Forza — The Procession of Beauty and Strenght — by Ermenegildo Luppi; on the right, Il corteo della Vita e del Lavoro — The Procession of Life and Work — by Adolfo Laurenti; in the middle, inside the pronaos, L’artista e le battaglie artistiche — The artists and artistic battles — by Giovanni Prini. The four crowning scupltures represent on the left, Architecture and Painting; on the right, Sculpture and Decoration. The Bazzani Palace with its wide internal rooms and high ceilings hosts the great collection of the Gallery, giving a lot of freedom in the management of the space. The rooms are distributed all around the Room of Ceremonies — Salone delle Cerimonie — in which sunlight arrives from above due to the presence of great windows and skylights. The building is above street level and subdivided into three levels: the first level includes the access arcade, the hall, around eighteen exhibition rooms and the café “il Caffè delle Belle Arti”. The second level contains around twenty-five exhibition rooms and includes a wide central court with a rectangular design and two fountains on the shorter sides; on the north-west side, you can find the Gallery bookshop. The third level has only eight small rooms and is the upper closure of the two extreme wings of the Palazzo. Due to the damages caused by World War II, Palazzo delle Belle Arti was restructured many times in the 50’s and 60’s. Among the many works, it is definitely worth mentioning the making of the great garden in front of the building where to host open-air exhibitions. Even the 70’s and 80’s saw many important changes: from the increase made by Luigi Cosenza to the new library designed by Costantino Dardi in 1987, up to the changes made to the right wing to host 20th century collections. Cosenza’s works had to face many struggles. The wing he designed was closed in 1998 as not in compliance with safety regulations. In the year 2002, it became the subject of an international redevelopment competition won by the Swiss studio Diener&Diener. The controversy following the proposal by the Swiss architects to demolish Cosenza’s work, allowed it to survive although it did not avoid its deterioration. The renewal started up by the director Cristiana Collu focused on recuperating the original overall function of the building in order to assign a specific task to each area and increase the value of the museum seen also as an urban tool. “Nothing has been added, we have just taken away an opaque layer” stated Collu “The architecture of this building encounters bright views that connect the internal part of the museum to its external part made by green areas, gardens, stairways and the city”. Director Cristiana Collu inaugurated the exhibition season of the museum in the room of the Main Hall in June 2016. The curator of the exhibition “The Lasting. L’intervallo e la Durata” is Saretto Cincinelli. The exhibition juxtaposes works by contemporary artists to those belonging to the collection of the Gallery of Alexander Calder, Medardo Rosso and Lucio Fontana and focuses on the thought regarding the concept of space and time. 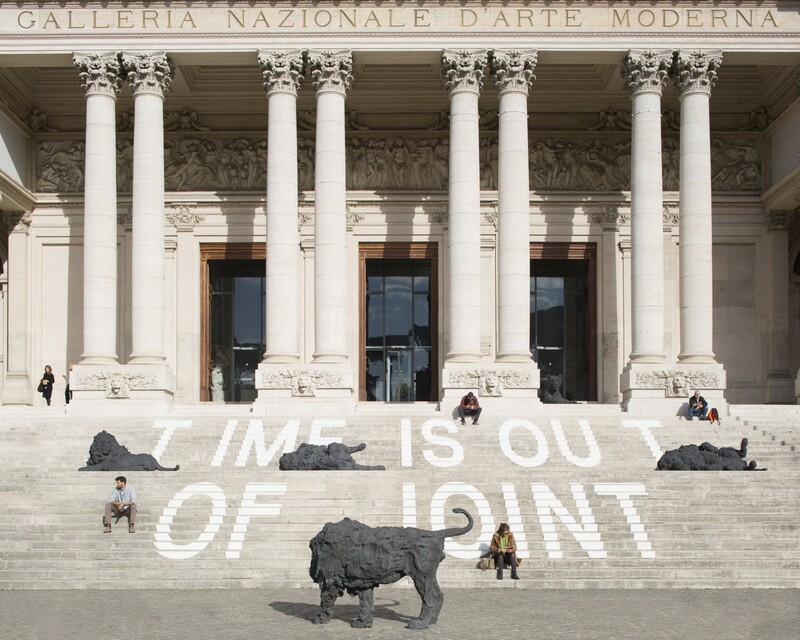 Time is Out of Joint instead is the title of the exhibition inaugurated on 10 October 2016 that, quoting the words of Shakespeare’s Hamlet, abandons the traditional concept of time. A non-linear time, but rather a stratified one. “Out of joint” stands for disconnected. The exhibition includes around 500 works from artists such as Giacomo Balla, Gustav Klimt, Lucio Fontana, Alberto Giacometti, Cristina Lucas and Sophie Ristelhueber. The works for the new setting involved both the collections and the building; the latter has re-achieved its purity and monumentality, whilst the rooms full of white give a great light and breath to the works. 43 windows have been opened and restored; the walls have been painted white; part of the garden was recuperated and 244 works were restructured. The area where the bookshop is used as an auditorium and for temporary exhibitions. The works brings back the Gallery to its original form and eliminate the previous works that had changed the museum paths. The central area is now again a place open to everyone, whilst the two side yards are now gardens that can also be used. Even the setting of the Rooms of the 1800’s and 1900’s has been reorganised and renovated. Light has the main role; it is all around the Gallery, and its relationship with the external area and the city is now a core aspect. The new setting of the monumental entrance was assigned to Martì Guixè. The renovation does not only regard physical space, but also includes the new name “the National Gallery” that has finally replaced the acronym GNAM — Galleria Nazionale d’Arte Moderna, the National Gallery of Modern Art. Even the logo made by Artemio Croatto e Chiara Caucig is new, simple and elegant. The idea behind the new arrangement is that of time that has to be reset through new and unexpected relationships within the symbolic space of the museum, as a flow of memories bringing together works of different periods. The works communicate with one another through assonance, contrasts, reference and cross-reference to stimulate different and unexpected suggestions, thus the possible interpretations multiply and establish a dialogue between present and past. This makes the paths easier to use and not compulsory. The daily activities of the National Gallery can be officially verified in its documents. The documentation is produced for practical, mainly legal-administrative reasons. In 1945, following the indication of the Curator of the time, Palma Bucarelli, the Photographic and Bio-iconographic Archives were established. The Historical Archive started in 1973 with the purchase of the first of the twelve current historical archives. The documents produced by the National Gallery are evidence of its many activities starting from 1883, the year of its foundation. The archive — the current one, the preservation and the historical one — are the official memory of the Gallery and the witness of its changes and developments. The documentation regards the organisation of all exhibitions held at the Gallery, the documents regarding the purchase, donation or loan — for exhibitions in other national and international museum — of each work of art. Furthermore, there is the documentation on the activity of the restoration laboratory, the library, the many archives, didactic activities, conferences held by globally renowned artists and critics and — in general — the many historical-scientific activities organised throughout the years. The archives allow us to see even the documentation regarding Awards granted to encourage young artists, communications with artists and collectors as well as the relationship with the Ministry of Education, the economic-financial management of the Gallery and that of its staff, the request of funds and the parliament hearings. The Bio-iconographic Archive — born thanks to Curator Palma Bucarelli in 1945 — contains documents — such as paper clippings, invitations, fliers, press releases, posters and photos — regarding over 25,000 artists. There is even a section of art themes with over 400 entries and 12 Historical Archives, all including an index and available online. The heritage includes precious documents such as the correspondence between Pietro Giorgi and Giulio Aristide Sartorio — a total of 38 letters, many of which painted in watercolour — or the documents belonging to the art critic, journalists and writer Ugo Ojetti — containing almost 6,300 files regarding artists, politicians and men of letters. There is then the even greater Archive of Antonio Maraini, artist, scholar, art critic, but — most of all — secretary general of the Venice Biennale. There is the archive of Valori Plastici — Plastic Values — a movement, whose most important artists are all present in the collections of the Museum; the Del Corso Archive and that of their Gallery L’Obelisco, full of amazing photos. There is the archive of the gallerist Mara Coccia and that of the 20th century applied Arts, a unique and precious documentation. There are then five archives of other artists present in the Gallery collections: Adolfo De Carolis’s Archive, with over 8,000 digitalised papers, among which many letters between him and Gabriele D’Annunzio; a collection of documents belonging to Giuseppe Capogrossi; the Umberto Prencipe Archive, and those belonging to Rolando Monti and Camillo Innocenti. The photographic archive is full of images, including the documentation showing the settings and exhibitions held in the Gallery as well as an important series of photographic plates. The Photographic Archive currently holds 10,000 black and white photo prints, 15,000 slides, 60,000 black and white negatives — among which 500 glass plates — 6.000 colour photos, VHS and DVDs. The photographic laboratory has always worked with a specialised photographer who documents all activities of the museum- e.g. works, exhibitions, events, restorations, etc. The prints are subdivided into seven sections: photos of works belonging to the museum; photos of works of artists achieved through donations or exchanges currently present in the Bio-iconographic Archive; settings of temporary exhibitions as well as permanent settings; the documentation regarding the restoration works made to the building, catalogue campaigns, photos documenting activities — inauguration of exhibitions or special events — VHS, audio material audio, CDs, DVDs containing documentations or donated by artists. The Library is one the services offered by the Gallery and has been present since 1915 when the museum was transferred into its current building of Valle Giulia. At the time, it had 2500–3000 volumes. The current library hosts around 79,500 volumes, among which about 1500 current and former magazines and a precious collection of miscellaneous items and brochures. A great heritage of monographic material and exhibition catalogues, rare volumes and books on artists. The library is no longer just the library of the museum; it has now become a place where to study, open to even to external specialists and students. Nowadays, the library of Rome’s National Gallery hosts — together with the Historical Archive of the Venice Biennale di Venezia — the most important Italian heritage of documents of contemporary art. The structure containing the library was designed by the architect Costantino Dardi at the end of the 1980’s, using criteria of extreme functionality and expansion. The library contains the following paper catalogues: Catalogue per author/title, Catalogue per subject, Catalogue of exhibitions in topographic order, Magazines Catalogue; Topographic Catalogue. The library has been part of the SBN pole of the University of Rome “La Sapienza” since 1998. All new entries have been catalogued via computer since then. The catalogue is available online as well as on the terminals present in the reading room. The official task of the Catalogue Office of the National gallery is to coordinate and scientifically direct all cataloguing activities of the historical-artistic heritage of the Museum. Moreover, the Catalogue Office takes care of the cataloguing and photographic campaign of important archives belonging to public or private organisations or coming from important private collections, in line with the historical tasks of the Gallery and in compliance with the preservation laws currently into force. Among the main activities there are the processing of systematic cataloguing projects and photographic documentation; the management of the paper charts archive; computerization of the printed catalogue and image digitalisation; information on artists and works of the 19th and 20th century. The archive of the Catalogue Office contains files on paintings, sculptures, drawings, prints, decorative arts and clothes coming from the museum collections. It consists of a paper archive and a digital database with over 9,000 files, steadily growing due to the computerisation and update of the old paper files and cataloguing of new acquisitions. The scientific cataloguing of the art heritage of the Gallery started at the end of 1965, directed by Giorgio de Marchis. Together with ICCD — Istituto Centrale per il Catalogo e la Documentazione, i.e. the Central Office for Cataloguing and Documentation — the Catalogue Office of the Gallery has contributed to the issue of the law provision regarding the so-called OAC files — Opere di Arte Contemporanea, Works of Contemporary Art — a specific tool to catalogue works of contemporary art. The National Gallery supports cultural promotion activities and offers the chance of internships within its offices aimed at developing new theoretical and practical skills that could be useful in one’s workplace. The publications department has a core of over 450 volumes that represent the main part of the publications of the Gallery starting from the early 1900’s. All texts can be viewed in the Museum Library. Most documents regard catalogues of temporary exhibitions, the most important of which are the rare catalogue-guides or itineraries of the collections showing the many settings of the museum during the years. The young Curator Palma Bucarelli intensified the exhibition activities compared to her predecessors Fleres and Papini, as documented in the relevant catalogues, opening up the museum to an always more international contemporary scenario that reached its peak at the end of the 60’s. In 1981 the direction of 4 museums were assigned to the Gallery — Ardea’s Manzù collection, opened to the public since 1981; the Boncompagni Ludovisi Museum of decorative arts, costume and fashion of the 19th and 20th centuries and the Mario Praz Museum, both born in 1995; the Andersen Musuem, inaugurated in 1999. This increased the number of catalogues of Italian and foreign exhibitions as well as collection guides of the Gallery. In 2015, the management of the four museums passed onto Latium’s Regional Museum Pole, thus the Library of the Gallery stopped including their publications in its own ones. Since the visitors’ observatory was established, the Gallery has made some publications on surveys made to its visitors. Finally, it is worth mentioning the online publications of the Gallery. The most representative one is Belle Arti 131-the online magazine of the National Gallery of modern art, published three times a year from 2012 to 2014 and fully managed by the Gallery even for what concerns publishing graphics. The magazine offers a view not only on single episodes or sectorial research, but also on the interdisciplinary character of the many aspects of museum life, in a close connection between practice and theory. 1976 saw the birth of the laboratory for the restoration of paintings and sculptures and the graphic restoration laboratory of the National Gallery. They are the only organisations of the museum that take care of the preservation and restoration of modern and contemporary works of art. The labs are subdivided per sector linked to the material used for the works and carries out highly specific activities. The lab contains a great archive of all restoration activities made, which can be consulted following authorisation. The lab carries out the following activities: verify, maintain and restore works of art; checking of the exhibition area; operational worksites and technical-scientific advice; design of the conservation and restoration works; direction and testing of the restoration works; audits to state organisations or other type of organisations; verify the preservation conditions of the works requested on loan; monitoring of the movement and packaging of the works; accompanying activities during the transfers of the works; Condition Report of the works on loan for temporary exhibitions; tutorial activity for training internships; scientific publications and participation to conferences. The office reports directly to the director and takes care of all steps regarding the planning and organisation of the exhibitions held in the National Gallery. Many exhibitions have been held since 1911, over 100 just in the last 15 years. The work of the Exhibition Coordinator and of the Registrar is fundamental during the four phases of the organisation of an exhibition — planning, making, opening to the public, closing. The technical coordination of the exhibition works in close collaboration with the curators of the event in order to give to the scientific project its final shape. The loans and registrations office manages the permanent collections of the National Gallery from the moment the works enter into the museum through the many different kind of acquisitions. Moreover, the office manages the loans of the works of art to other organisations for exhibitions and events. The National Gallery obtains its works permanently through donations, purchases, bequests or conveyances. All donations, sales or conveyances must be addressed to the Direction of the Gallery. The Gallery loans — temporarily or on long-term — its works for exhibitions or events, following a careful assessment made by the preservation Labs. Loans abroad must be authorised by the Ministry of cultural heritage, activities and tourism. The task of the press office is to interact with the media. The press office in the National Gallery organises conferences, prints out press releases, brochures and information leaflets, coordinates advertising campaigns and manages digital communications. The activities currently made by the educational Services office of the National Gallery follow a long tradition of services the museum has developed during its decades of activity. Already after World War II, Palma Bucarelli — with the help of Giulio Carlo Argan — imagined this museum as a place of research and experimentation in a close link with the University of Rome. The paths currently offered by the Gallery are based on a vision of art aimed at stimulating the individual and collective sensitivity and intelligence. Due to the great collection of works, the specialised internal and external personnel of the Gallery organises projects and guided tours open to everyone, children or elderly people, occasional tourists or disabled persons, people suffering from psychological or cognitive disorders. The three large rooms inside the museum host labs offering playful activities to educate and stimulate creativity. The Gallery even offers its visitors activities studied together with voluntary associations such as Museum to create tactile paths studied to allow blind or partially sighted people to get to know the collection of the museum. Moreover, 2011 saw the birth of a project for people affected by Alzheimer’s disease through the collaboration with the Catholic University of the Sacred Heart and A. Gemelli General Hospital of Rome. The educational services offered by the Gallery are for people of all ages and social classes. The personnel is highly specialised and sensitive to any kind of need the visitor may have. With collections encompassing some 20,000 paintings, drawings, sculptures and installations, the Galleria Nazionale d’Arte Moderna e Contemporanea is a lavish representation of artistic culture from the 1800s to the present day.